On Saturday night 22 October 2011 an unknown armed group has kidnapped three foreign solidarity workers who were in a humanitarian mission in the Saharawi refugee camps. I am very grateful for the opportunity and the privilege to speak to the Fourth Committee today. I am here as an independent citizen. I am not affiliated with any political group or representing any government. It is our duty as citizens, to remind our leaders of their responsibilities when injustice occurs. This entry was posted in Political issues on October 11, 2011 by appleton. The “Arab Spring” sends us a very clear message: the people must speak! Across North Africa and the Middle East, people are crying out for a free choice over their future. This entry was posted in General, Political issues on October 11, 2011 by appleton. 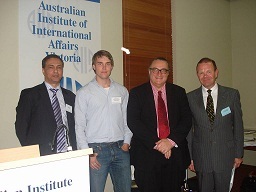 The Australian Institute of International Affairs hosted an event on Wednesday 5th October in Melbourne on the issue of Western Sahara under the title: Western Sahara and its Phosphate Rock: is Australia in a Hard Place? The speakers during the event were the Saharawi representative to Australia Mr Kamal Fadel and Mr Tim Robertson SC, who is a senior barrister and civil libertarian with a very broad practice including international law. This entry was posted in Phosphate importation on October 10, 2011 by appleton. In a letter sent to UNHCR dated 30 September 2011, AWSA calls for urgent action by the UN Commissioner for Human Rights to intervene and protect Saharawis who are under violent attack by Moroccan settlers in the city of Dakhla in occupied Western Sahara. It is understood that the Moroccan security forces and police have not acted to protect the lives and property of the indigenous Saharawi. This entry was posted in Human Rights, Political issues on October 4, 2011 by appleton. DAKHLA, Western Sahara (Reuters) – Moroccan security forces deployed in the city of Dakhla in the disputed territory of Western Sahara this week after an outburst of violence that pitted members of the indigenous Sahrawi population against their Moroccan neighbours. Moroccan officials said 7 people were killed after rival groups of supporters clashed following a soccer match last Sunday, and local criminals then joined in the violence. “Since 25 September 2011, the Saharawi civilians in Dakhla, in the south of Western Sahara, are facing brutal and oppressive attacks from Moroccan armed militias. These militias reside in the Alwakala neighbourhood, home to thousands of Moroccan settlers brought into the territory by the Moroccan government in 1991, to participate in the envisioned referendum in Western Sahara…..
AWSA summarises a week of violence and repression in Dakhla on the southern coast of occupied Western Sahara.